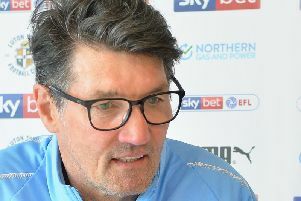 Modest Town boss Mick Harford once more put all the praise on to the players after they set a new club record of 28 league games unbeaten at the weekend. The 2-2 draw with Blackpool, means Hatters are now without a defeat since mid-October and went one better than the previous record in the third tier of English football, held by Bristol Rovers. They come in, work their socks off, it should be a proud bunch of players in terms of what they’ve achieved this season. Harford said: “It’s testament and I keep saying it, to the players who work hard every day. “They come in, work their socks off, it should be a proud bunch of players in terms of what they’ve achieved this season. “I said to them, in my opinion, that’s one of the best performances I’ve seen from a team this season, even though we didn’t win, in terms of the effort and commitment and the drive and desire to try and get back into the game after going down to 10 men. Luton beat the record of 27 games they set on their way to the Conference title in the 2013-14 season. Midfielder Pelly-Ruddock Mpanzu is the only player still with the club from those days, as he said: “Whatever unbeaten run you go on is great, so to be part of both of them is unbelievable. It’s great to do it once but to do it twice is a great feeling. “The Conference is so hard to get out of, only one team goes up, so it’s equal bearing. “We were in the Conference a long time before I came, so to get out of the Conference is a big feeling, also to go into the Championship is big for the future of the club. “Going to a new stadium too, it’s great for us.